Just how likely is it that a drone hits an aircraft and causes a death or injury? Not very, according to research from George Mason University. The study suggests the Federal Aviation Administration could significantly loosen rules regarding private drone use and not endanger general aviation. Citing a number of "near misses" with drones, the FAA recently began requiring pilots to register before flying their drones and agree to abide by several basic rules of the sky. Almost 400,000 pilots have registered in the last three months, the FAA said on Monday. The FAA's requirement, covering drones weighing over 250 grams (0.55 pounds), got George Mason University research fellow Eli Dourado thinking: Just how dangerous might drones be? He started by turning to the FAA's wildlife strike database, a voluntary database of incidents involving animal strikes with aircraft, and married that with an estimate of 10 billion birds in U.S. airspace. He looked at the amount of time the birds spend flying and where bird strikes happened. He also drew on an FAA database of the average weight per species. "A two-kilogram drone would cause an injury once every 187 million years of continuous operation," he said. Put another way, with a million drones in the sky flying continuously, they'd lead to an accident that would cause an injury or death once every 187 years. "It’s pretty safe by existing aviation standards," he added. Dourado did the research with Samuel Hammond, a master's degree fellow at the university. Dourado admits there are some limitations to his estimate. Birds are softer and more likely to get squished on impact than drones made of plastic and metal, so they might represent less of a threat. But birds are also more likely to be encountered in flocks, where the danger of having several sucked into two or more engines is greater. Perhaps the most famous instance of this was US Airways flight 1549, which had to ditch into New York's Hudson River after numerous bird strikes took out both engines. The 2009 water landing caused several injuries, most of them minor. The research also doesn't take into account the possibility of someone maliciously trying to hit an aircraft -- something a bird is unlikely to do, but also something that it's almost impossible to regulate against. The takeaway from the study? 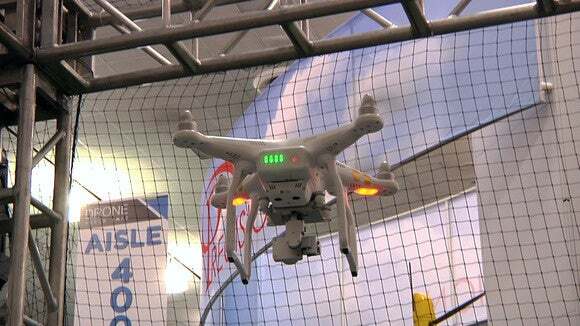 "The FAA is considering a micro UAS rule that would allow a 2kg drone to operate in more or less unregulated fashion as long as it stays away from an airport," said Dourado. "This shows it’s a pretty good approach, and we could go a bit heavier."